After almost two years of deliberation, Barack Obama’s administration is expected to enact regulations next month that will attempt to protect trackside communities from exploding oil trains. However, the new rule won’t take the one step that could decrease the risk almost immediately — requiring North Dakota oil producers to either reduce their product’s explosiveness or ship it in pressurized cars. Officials say they can’t take that step because nobody really knows how to reduce or properly measure the oil’s volatility. Roughly a dozen oil trains have exploded in the United States and Canada in the past 21 months, including one in Quebec that left 47 people dead. The U.S. Department of Transportation has repeatedly warned of the unusual volatility of North Dakota’s oil. But the draft of the new rule that was released in July didn’t include anything to limit the oil’s volatility, and officials say the final rule won’t either. That falls in line with the urging of the American Petroleum Institute (API), the oil and gas industry’s largest trade group, but it’s likely to anger those residents and activists living near rail lines on which the oil trains travel. Nancy Casler, who lives near tracks in Menands, New York, says the DOT needs to address her concerns about both tanker standards and volatility before she and her family can feel safe again living next to what she considers an immense rolling pipeline. The White House supports the DOT’s decision, said a White House official who asked not to be identified, in part because the state of North Dakota recently enacted rules that require oil companies there to reduce the volatility of the oil before shipping it. But critics argue that the North Dakota restrictions don’t reduce volatility enough. The DOT requires flammable gases such as propane to be shipped in pressurized rail tankers. Oil, on the other hand, is transported in unpressurized cars. But North Dakota’s oil can fall into both categories. It starts its journey as a liquid that contains high amounts of propane, butane and other flammable gases. During the trip to the refinery those gases can separate and form a blanket of combustible gas on top of the oil. If one of the rail cars ruptures and the gas is ignited — perhaps by a spark thrown off in a crash — it can explode and cause adjacent cars to do the same. In an interview with Reuters last year, the DOT’s deputy associate administrator for hazardous materials safety, Bill Schoonover, suggested that under federal rules a mixture of flammable oil and flammable gas should be transported in a pressurized tanker. Lagana said the DOT and other federal agencies will continue studying the volatility problem and still hope to come up with sampling and testing guidelines. “We also encourage the industry to do what they can to increase the safety of the product they are shipping,” she said. Experts acknowledge there is no proven way to link any specific chemical property of oil to the likelihood or severity of an explosion. But they also say the risk can be reduced by using a piece of equipment called a separator to boil off some of the combustible gases the oil contains when it comes out of the ground, including propane and butane. “The notion that this requires significant research and development is a bunch of BS,” said Ramanan Krishnamoorti, a professor of petroleum engineering at the University of Houston. “The science behind this has been revealed over 80 years ago, and developing a simple spreadsheet to calculate risk based on composition and vapor pressure is trivial. This can be done today.” he wrote in an email. The API has steadfastly maintained that North Dakota crude is no different from traditional crude oil in terms of volatility and argues that no federal restrictions should be placed on the volatility of oil transported by rail. API did not respond to numerous requests for comment for this article. If gases such as propane and butane remain in the oil until it gets to the refinery, they can be processed and sold separately for a profit. If they are boiled off at the wellhead their value is usually lost. Boiling off the gases at the wellhead can increase air quality problems in drilling areas, but transporting the oil without removing at least some of the gases increases the likelihood and severity of oil train explosions, according to many oil and gas experts. The DOT’s decision not to address volatility in the new rule leaves trackside communities in a bind because it will be years before the key safety measure in the draft rule — upgrading the fleet of roughly 100,000 rail cars that carry the oil — can be fully implemented. Under the proposed rule, some of the highly vulnerable tank cars could still be hauling volatile North Dakota oil until 2021 or later. And whether the new tanker standards will ensure safety is still a matter of heated debate. Under North Dakota’s regulations, which went into effect April 1, oil and gas developers must have separators or similar equipment at their wellheads to reduce the oil’s vapor pressure to no more than 13.7 pounds per square inch. But North Dakota’s cap is higher than 9.3 psi — the vapor pressure of the oil that blew up in Quebec in 2013. It’s also higher than the 10-psi vapor pressure cap for oil transported by pipelines, a cap enforced by the U.S. Environmental Protection Agency. Twenty-five years ago, the DOT used vapor pressure, initial boiling point and flashpoint to gauge volatility. In 1990, it dropped vapor pressure. 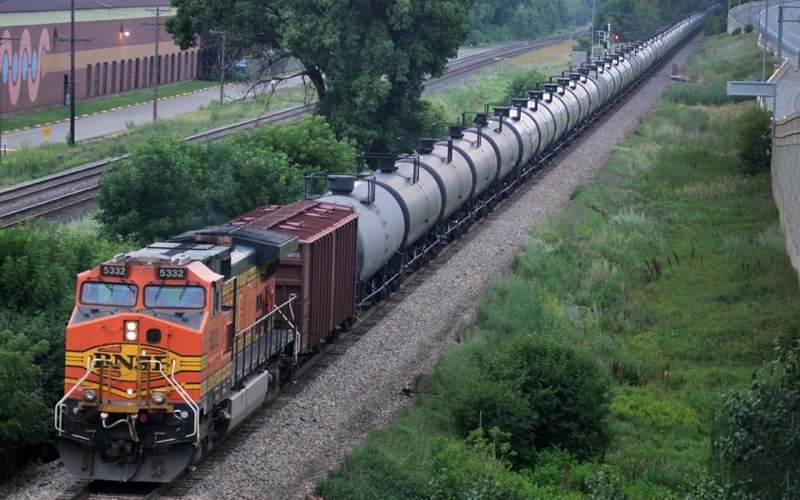 In the wake of the recent spate of oil train explosions, it is again focusing on vapor pressure. A month later, a DOT emergency order warned emergency planners around the country that crude oil transported in rail cars is “an imminent hazard to public health and safety and the environment” and ordered shippers to conduct “proper testing” of the oil. Members of Congress who represent communities that lie along the oil train routes have expressed frustration with the pace and scope of the administration’s safety efforts. Four Democratic U.S. senators recently announced legislation that deals directly with the volatility issue. The bill would require the DOT to issue an interim rule within 90 days limiting the concentration of flammable gases in crude oil before it is transported. After that, the DOT and the Energy Department could continue studying the oil’s volatility in order to make any necessary adjustments. While the Republican-controlled Congress isn’t expected to approve the legislation, it’s seen as a plea to the White House from Democratic senators in states where oil trains have become controversial not to enact a rule that is silent on the matter of volatility. “This bill is showing our impatience with the fact that we’re in a rulemaking process that doesn’t include volatility and we think that it should,” said Sen. Maria Cantwell, D-Wash., one of its co-sponsors. Local officials are even more frustrated. This is a great article. Why do we have to wait for Al Jazeera to put forth such good journalism?